A diet rich in fruits is always recommended, especially during pregnancy. But, to ensure the safety of you and your baby, everything should be consumed with much caution in pregnancy. Then how about strawberries? We all love them, don’t we? Strawberries are very nutritious, containing vitamin C, magnesium, calcium and other vital nutrients. Can strawberries be eaten during pregnancy? Can You Eat Strawberries During Pregnancy? Loaded with nutients, strawberries are a great fruit to consume during pregnancy. However, you should be very careful when it comes to the quality and quantity of strawberries you consume. Swelling of the oral cavity, mouth, and lips, etc. What Are the Benefits of Eating Strawberries During Pregnancy? Strawberries in pregnancy are a real treat. The following nutrients can nourish both you and your baby. Folate – It helps in the development of the baby's brain, skull, and spinal cord. Potassium – It is a great mineral necessary for a normal function of the new mom’s heart. Iodine – It promotes the normal functioning and development of the baby's brain and nervous system. Manganese – It is very important for building and maintaining the skeleton of the growing fetus. It is also well known for its anti-inflammatory effects and the ability to fight free radicals. Vitamin C – It normalizes the blood pressure, prevents diseases like macular degeneration and strengthens the immune system in general. Vitamin A Together with Vitamin E – They are known as the beauty vitamins. These two vitamins will make you look attractive and beautiful while pregnant. Natural Sugars – It stimulates mental activity and memory. Endorphin – It helps improve the emotional state of the expecting mother. Fiber – It is important for the normal functioning of the gastrointestinal tract and regular bowel movements. Antioxidants – They neutralize the free radicals in the cells and prevent cancer. Phytochemicals – They are natural plant chemicals, beneficial to both the mother and the baby. The following table shows the amount of main nutrients contained in one cup of fresh strawberries. Now you may want to eat strawberries to reap all the nutrients and health benefits. But keep the following tips in mind to ensure safety. First of all, you need to talk to your doctor about any food allergies, especially if you have a family member who is allergic to strawberries. Strawberry allergies tend to run in the families. Even if you are not allergic, your doctor might advise you to avoid this fruit during pregnancy. 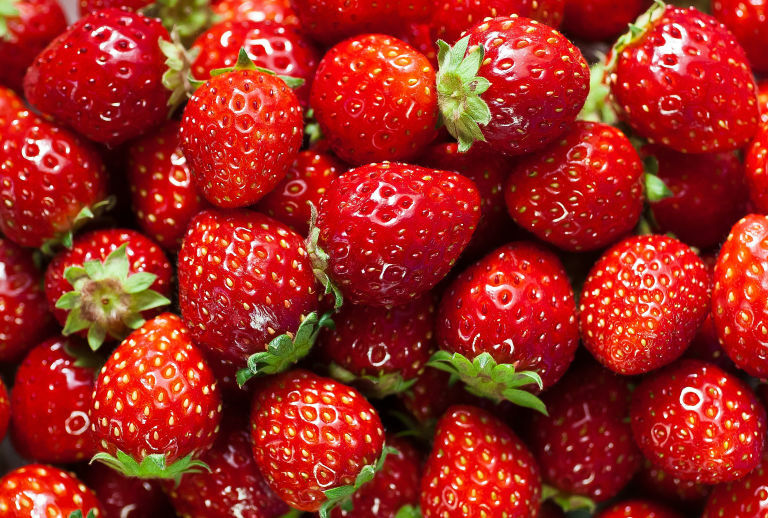 Make sure to wash the strawberries thoroughly before eating them, as they may have pesticide and fertilizer residue. A thorough washing will also help eliminate any bacteria or parasites, such as E. Coli. Eat fresh strawberries. Don’t eat strawberry jams or other strawberry-flavored treats. They are not healthy as fresh strawberries are. 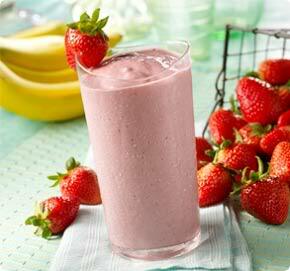 Strawberry juices are also healthy; just make sure to choose pasteurized juices. Remember that unpasteurized juices are a potential source of E.Coli and other food-borne illnesses. Don’t eat just strawberries during pregnancy. Make sure to eat other fruits and vegetables too. 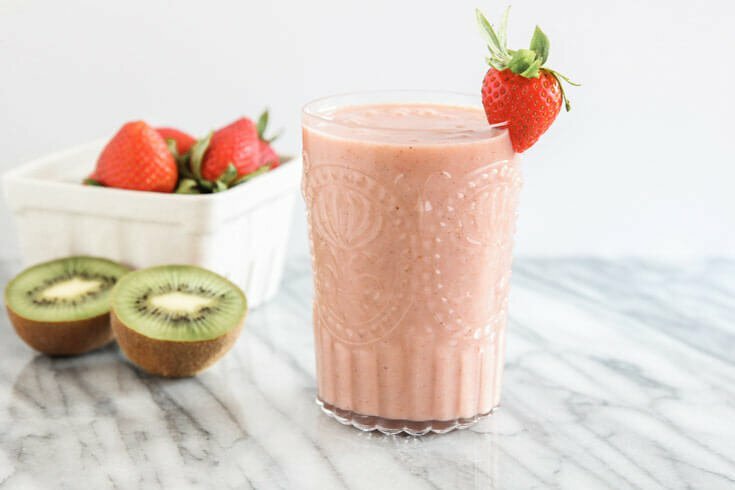 Strawberry smoothie is a great snack during pregnancy. Here are two recipes.